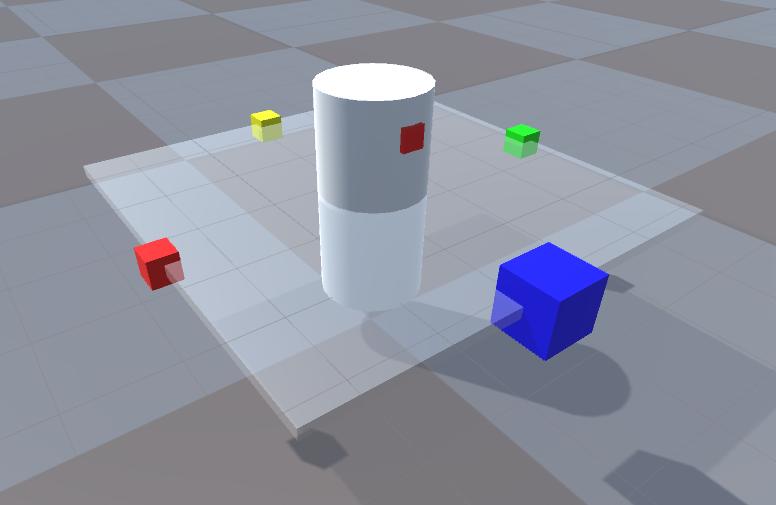 A plane-object (big, transparents cube in this picture) is always setting its transform.position to that of the player (white cylinder). When pushing the right control-stick on the controller left and right, the plane-object rotates (around the player) - which is what I want, because the Main Camera is attached to the plane-object, so it effectively hovers around the player as well. Also attached to the plane-object are four colored squares, the blue one declaring the "front." The front-cube is always facing the camera. My problem now is that I want to move the player forward, backward, left and right not according to the World Axis, but two Axis established by the colored blocks. So there should be an artificial Z-Axis between the blue and yellow cube, and an artificial X-Axis between the red and green cube, and when I, for example, press "Down", I want the player-object to move towards the blue cube, "along" the Axis between the blue and the yellow cube. Does that make sense? Long story short, I want to create a simply camera-system where the player's input and the resulting direction of the movement/velocity is relative to the camera-angle, and I thought this could be a good approach if only I can somehow establish that the player should be moving along those two new imaginary axis. Ideally, I would derive the direction that the player-object should be facing from this system as well. Is that feasible and possible? If so, how? Or is it needlessly complicated, and I'm forgetting something? Oh, haha, I was definitely implying that I wanted to solve this problem by scripting. I'm still somewhat unexperienced, but not entirely unfamiliar, and yes, you're correct! I want the player to move according to how the camera is rotated. I've since asked somebody else - apparently, a more reasonable solution would be to check for the camera's relative position in world-space and realign the characters' axes to that. I don't need these boxes as an indicator for axes anymore. Thank you for your advice though! Really nice. Oh ok than it shall be fine :D. I'm also not that experienced so I'll just skip explaining details... Here's a quick code I created if you need something. And maybe you can look at this post or google "Unity 3rd Person Controller", there should be a lot of tutorials! // Put this on a object. In play mode press WASD and it should be moving based on camera angle.